A breeding breakthrough. 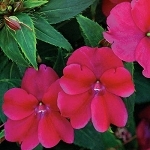 These hybrid impatiens will perform through shade OR brutal sun and high heat & humidity. Fast growing & needing little maintenance –they recover quickly from lack of water. Upright or Spreading - Some tough stuff! Beautiful variegated foliage with brightly colored flowers that grow in shade or sun! 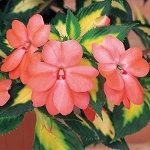 Upright Sunpatiens that grow in shade or sun!